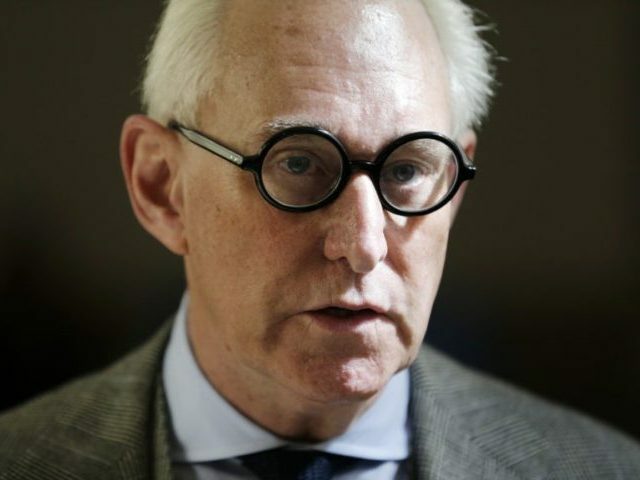 Veteran political operative Roger Stone has been arrested in Florida, according to the office of the special counsel led by Robert Mueller. CNN claims to have video in which FBI agents are heard pounding on the door of Stone’s home in Fort Lauderdale, FL, this morning where he was arrested. The indictment centers on allegations that Stone attempted to pass messages to Julian Assange, the head of WikiLeaks (apparently identified in the indictment as “Organization 1”) through an intermediary, then obstructing the special counsel’s investigation into those contacts. It specifies two associates — “Person 1,” a political commentator, and “Person 2,” a radio host — who Stone allegedly requested to pass messages to Julian Assange, who has been living inside London’s Ecuadorian embassy since 2012. On or about September 19, 2016, STONE texted Person 2 again, writing, “Pass my message . . . to [the head of Organization 1].” Person 2 responded, “I did.” On or about September 20, 2016, Person 2 forwarded the request to a friend who was an attorney with the ability to contact the head of Organization 1. Person 2 blindcopied STONE on the forwarded email. The indictment then alleges that Stone “made deliberately false and misleading statements” to the House Permanent Select Committee on Intelligence (HPSCI) in 2017 as the committee investigated Russian interference in the 2016 election. Prosecutors then say Stone directed Person 2 to lie to investigators so as not to contradict his own testimony, then becoming angry and apparently threatening the radio host and his dog. On or about October 19, 2017, STONE sent Person 2 an excerpt of his letter to HPSCI that identified Person 2 as his “intermediary” to Organization 1. STONE urged Person 2, if asked by HPSCI, to falsely confirm what STONE had previously testified to, including that it was Person 2 before the committee. After being contacted by HPSCI, Person 2 spoke and texted repeatedly with STONE. In these discussions, STONE sought to have Person 2 testify falsely either that Person 2 was the identified intermediary or that Person 2 could not remember what he had told STONE. Alternatively, STONE sought to have Person 2 invoke his Fifth Amendment right against self-incrimination. Several news outlets have zeroed in on the indictment’s statement that Stone and a “high-ranking Trump Campaign official” emailed each other about WikiLeaks’ Podesta emails several days before the first batch of messages were made public. “Shortly after Organization 1’s release, an associate of the high-ranking Trump Campaign official sent a text message to STONE that read ‘well done,’” the document says. This “high-ranking Trump Campaign official” appears to be former Breitbart News Executive Chairman Stephen K. Bannon, based on emails described in the indictment document that had been previously published by the New York Times.